Tokaj is on the eastern edge of Hungary, not very far from the Solvakian (and Ukranian) border. Here the architecture and style could scarcely be any more ‘East European’ with onion domes and gabled roofs, and every conceivable part of the pig on the plate. It’s been at least 15 years since I last visited Tokaj, so I was looking forward to seeing what had changed. Certainly the hotels! The eponymous hotel remains in the town of Tokaj itself, and it is a ghastly eyesore which cannot really be attributed to the Soviets so much as the general malaise of seventies construction. It was probably all the rage at the time, but seriously needs to be rage-d to the ground now. The Andrassy, however, where we were treated to staying, is perfection. The first producer we visited was Barta Pince in Mád. We were greeted by Attila Homonna, the head winemaker who is also a consultant for four estates, and makes his own wines (in both Balaton and Tokaj), all of which are highly regarded, as I was to find out. First we tasted some of Attila’s own dry wines. Aged in Austrian and Hungarian oak barrels, his Homonna Furmint/Harslevlu 2014 has leafy, peppermint and floral scents and is honeyed and dry with oily texture and rich fruit, really superb. The 2013 was, if anything, even better, a legacy of a superior year. The pure Furmint 2014 (well, with 10% Harslevlu) was just wonderful also, from the second oldest vineyard in Tokaj, originally planted in the 1140s. Then onto the Barta wines themselves, from the Kiraly vineyard of Mád. A well extracted earthy dry Furmint 2012 which showed the richness of the year and onto the first sweet wine, Szamorodni 2013 which has wonderful flavours of orange blossom, some walnut and pecan, marmalade and funk. Despite a hefty amount of sugar, this manages to finish almost dry, in the way that only Tokaji (the place is Tokaj, the wine is Tokaji) really can. Szamorodni means (roughly) ‘as it comes’ and the wines can be anything from (rarely) completely dry to intensely sweet. The labels will usually say which, although if the wine is in clear glass it’s obvious enough. The traditionally labelled and made Oreg Kirali Dülo 2010 6 Puttonyos Aszú followed. Terrific, and very sweet indeed. Lastly we tried Möbius 2008 the name was to indicate ‘never ending fermentation. At five years, it was certainly drawn out, and the wine managed to get to 16½% alcohol before stopping with a little sugar left. It has developed wonderful nutty oxidative aromas and tastes sweeter than it is, but it is just a superb, wonderfully rich, mouthful of wine. Before we left we were treated to a tour of the exquisitely restored – with every attention to period detail – guest rooms of the main Rákóczi-Aspremont mansion which is at the heart of property. 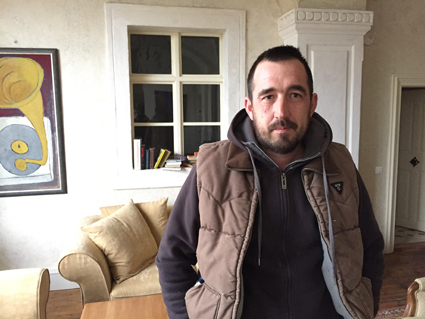 Next we met the wonderfully enthusiastic Laszlo Majoros, at his family winery (he also makes wine for the large Tokaj Trading House Co-operative. It was very refreshing to start with a dry Muscat, the grapey, crisp Sargamuskotaly (Muscat Blanc) 2015 but then we were treated to a cellar tasting of great rarity and incredible generosity. For a producer with just 7 ha, Laszlo certainly experiments to get to his many versions of perfection! Hungarian, French and American oak. Different sizes, different ages. One grape, Furmint. Although – obviously - from the very different Deak and Agyag vineyards . 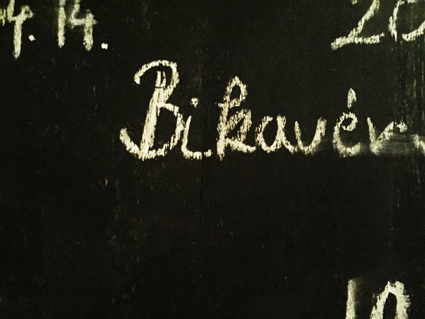 The permutations are endless, and we tried lots of delicious wines. As Laszlo himself, I think I preferred the wines from Hungarian oak, and generally the larger and older barrels. Laszlo is also experimenting with some extended ageing with a dry wine called “Basic Instinct” 2011, which is a wonderful oily textured nuts and honey flavoured wine, almost an orange wine in style, this is a revelation for Tokaj. The memorable tasting (20 wines!) concluded with a range of Aszu wines, the last and certainly greatest (of a collection of great wines) of which was his ‘Major+’ Single barrel Tokaji 6 puttonyos Aszu 2008 which has aromas and flavours of toast, butterscotch turkish delight, orange, and spice. It’s fresh, nutty but limey with oak flavours. Very special indeed. The following day we met Samuel and Mathilde Tinon, in Olaszliszra. 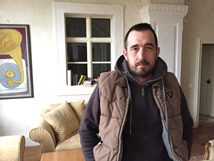 Originally from France, Samuel arrived in Tokaj in 1991 and worked at the famous Royal Tokaji Company. 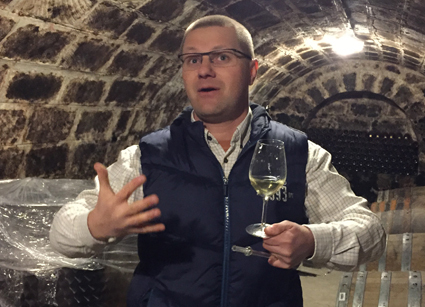 Samuel makes a full range of sweet Tokaji wines, but has become somewhat celebrated for his very dry Szamorodni wines, a rare style in Tokaj (it is only really him and Attila Homonna making them in fact). There were moves to cancel the designation Szamorodni for dry wines, but these are a vital part of Tokaj’s heritage, and even though there is a potential for confusion, in today’s market somewhere that can make world class dry wines is even better placed, commercially, than famous sweet wine areas, which Tokaj certainly is. So, Tokaj needs these wines to show off its diversity. And what wines they are! Grown with botrytis in the vineyard and flor yeast in the cellar, the Szamorodni 2007 Dry is really fresh and mouthfilling, almond-skin nutty, and mildly oxidative, but with a rich but dry finish. The Szamorodni 2003 Dry is even more intense and sherry-like. Just fabulously rich and concentrated. Some of the only dry wines in the world made with botrytis. And definitely the only wines that then see flor ageing. Our drive back to Budapest could have gone along the motorway, or alternatively it could go through the mountains, and via the exquisite city of Eger, famous for its Bikaver, the Hungarian name for Bull’s Blood. So we chose that way, and visited Thummerer where we were warmly greeted by Vilmos Thummerer and Jozsef Lamport. 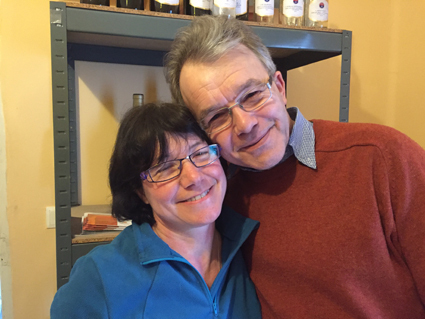 Despite having only been founded in 1990, Thummerer is making a wide range of decidedly accomplished wines indeed in their wonderful cellars. I particularly enjoyed the Chardonnay 2013 and both Bikaver Superior 2011 and Bikaver Grand Superior 2012 Nagy Eged. Each is a wonderful fusionsof the local Kekfrankos with international varieties, and – very rarely for Eger – even a little Kadarka. The reds concluded with an astonishing Cabernet Franc 2007. Cabernet Franc had been something of a theme for me during this trip to Hungary, and I tried many wines from Villany and beyond, but this Eger wine was one of the very best. Amusingly Vilmos and Jozsef once made a series of Kosher wines which didn’t really sell well enough, so they were sold in the domestic market with Kosher seals, but under name “Trefli” which means ‘non kosher’ in Yiddish. These off-dry wines now sell really well in Hungary and no longer need a rabbi to help prepare them. All in all a great way to end a wonderful few days in Hungary, surely one of Europe’s undeservedly less well known gems, in terms not just of wine, but people and culture too. 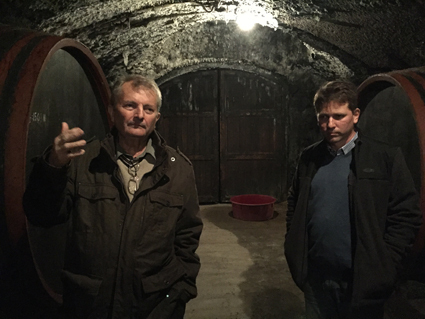 Many thanks to our guide, Jószef Kosárka, to Tamás Keleman for a lot of driving, to Elizabeth Gabay and Michael Schaefer for the company, and to VinCE and all our hosts in Hungary. Egészségedre!